This year, the Electrical Safety Foundation International (ESFI) conducted a survey of electrical designers, planners, and engineers who design or renovate systems in industrial facilities, healthcare facilities, and IT centers. 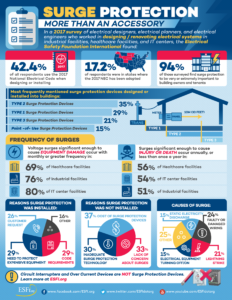 In response to the survey results, which demonstrated a limited or misinformed understanding of surge protection devices (SPDs), ESFI created educational materials to spread awareness of the purpose and effectiveness of surge protection. If you only remember one thing from this article, it should be the SPDs are not accessories. 94% of experts surveyed consider surge protection to be very or extremely important to building owners and tenants. It is vital that businesses with valuable equipment keep this mind when performing renovations or construction. While surges significant enough to cause injury or death are not a major concern, with instances occurring once a year or less, voltage surges significant enough to cause equipment damage occur with monthly or greater frequency in 69% of healthcare centers, 76% of industrial facilities, and 80% of IT centers. Another important factor revealed by this survey was the failure of industry engineers and experts to distinguish surge protection devices from over current devices or circuit interrupters (such as a GFCI breaker). SPDs are designed to handle fast transients or surges, rather than excess voltage or current. While some Type 1 SPDs may be equipped with external overcurrent protection, it should be noted that this is not the case with all variations of SPDs, and that it is not the preliminary function of the devices. Likewise, overcurrent devices do not provide surge protection. Surge protection devices are not only recommended by engineers, designers, or electricians in an attempt to upsell you; SPDs have been required by the National Electrical Code since 2014. It also appears as if electrical engineers and designers are implementing modern safety standards to property owners and businesses in states that are years behind the national standard. Although only 17% of respondents were in states where the 2017 NEC is adopted, 42.4% of respondents claim to use the 2017 NEC when designing or installing electrical systems. Of course, the 2017 NEC cannot always be implemented, as in some cases, buildings cannot support the 2017 surge protection requirements and older devices must be installed. Regardless, it remains clear that any type of surge protection is better than none. 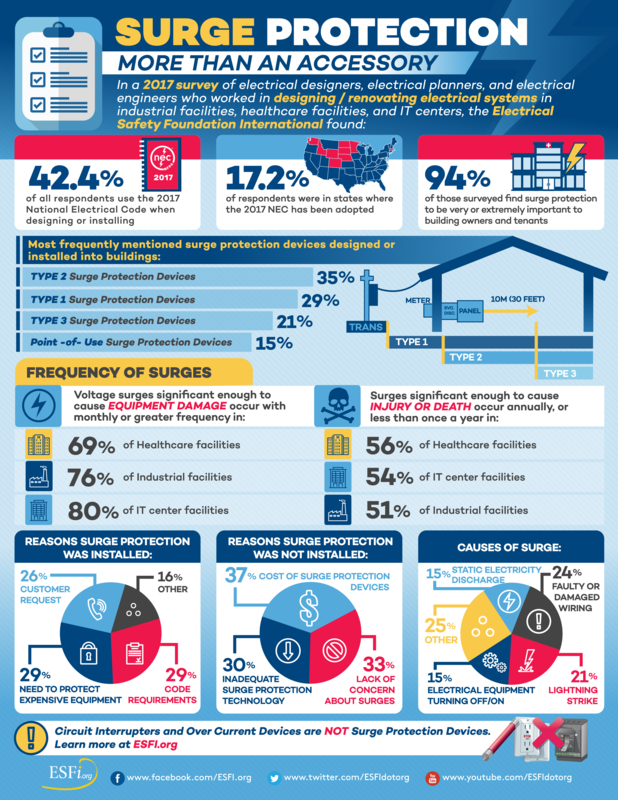 For the complete results of ESFI’s Surge Damage Survey, or to learn more about surge protection devices, visit www.esfi.org. The Electrical Safety Foundation International (ESFI) is the premier non-profit organization dedicated exclusively to promoting electrical safety at home and in the workplace. Since 1994, ESFI has led the way in promoting electrical safety across North America. Over the years, ESFI has become highly regarded by industry, media and consumer safety partners alike by constantly reinvigorating the way electrical safety is addressed. ESFI creates unique awareness and educational resources designed to meet the diverse needs of a variety of at-risk groups.